I DO WILL IT. BE MADE CLEAN. Our readings this Sunday call our attention to the norms of purity and social boundaries. There was a clear and impenetrable boundary between the "clean" and the "unclean". It was a time when affliction was thought to be a punishment from God for past sins. In our first reading (Leviticus 13:1-2, 44-46), we hear the beginning and end of a long prescription on how to deal with someone with a scaly skin infection. Cast out from society, considered unclean added misery upon misery. The Lord said to Moses and Aaron, "If someone has on his skin a scab or pustule or blotch which appears to be the sore of leprosy, he shall be brought to Aaron, the priest, or to one of the priests among his descendants. If the man is leprous and unclean, the priest shall declare him unclean by reason of the sore on his head. "The one who bears the sore of leprosy shall keep his garments rent and his head bare, and shall muffle his beard; he shall cry out, 'Unclean, unclean!' As long as the sore is on him he shall declare himself unclean, since he is in fact unclean. He shall dwell apart, making his abode outside the camp." 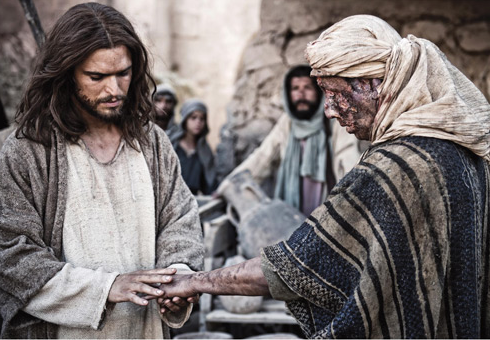 In our Gospel reading (Mark 1:40-45), we hear just how easily and quickly Jesus was to cast aside social taboos in his compassion and love for the suffering and downcast. Not only does the leper cross the boundary by approaching Jesus, but Jesus renders himself impure but touching the person with leprosy. The lepor's faith is met by Jesus healing touch. He said to him, "See that you tell no one anything, but go, show yourself to the priest and offer for your cleansing what Moses prescribed; that will be proof for them." The man went away and began to publicize the whole matter. He spread the report abroad so that it was impossible for Jesus to enter a town openly. He remained outside in deserted places, and people kept coming to him from everywhere. In our Epistle reading (1 Corinthians 10:31 - 11:1), St. Paul sums up his teaching with the What to Do and the How to Do of Christian life. What: "Do everything for the glory of God"; How: "Be imitators of me as I am of Christ." Brothers and sisters, Whether you eat or drink, or whatever you do, do everything for the glory of God. Avoid giving offense, whether to the Jews or Greeks or the church of God, just as I try to please everyone in every way, not seeking my own benefit but that of the many, that they may be saved. Be imitators of me, as I am of Christ. Boundaries are comfortable; they are easy. St. Paul challenges us to be "imitators of Christ". That may mean crossing the boundaries of social norms in the name of Compassion - in the name of Christ.